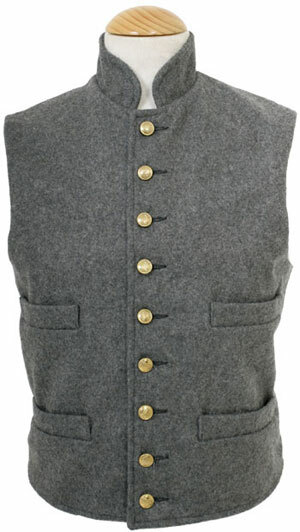 New for 2016 a variation on our old favourite the Napoleonic Officers Vest. This version has stand up/out lapels which show when your coat is done up. Available with flap or standard welt pockets (the normal type of pocket on a vest). Available in a range of brocade colours, and as standard has a satin back and lacing at rear waist. Please note this item is not held in stock and will be made to order in about 10-12 weeks depending on how busy we are! Please Note: Waist size refers to your largest stomach circumference, NOT your modern trouser size. Our best selling shirt!! Made from tough 100% cotton, off-white in colour. 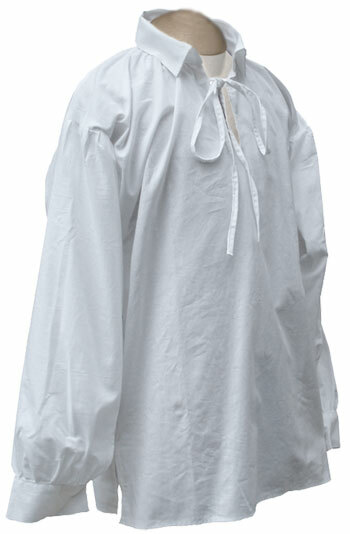 Pull-over design, fitted with small 'penny-round' collar, sleeves are tubular with triangular inlets as per original examples. These shirts are made to be big (too big by today's standards)as per original styles. Don't order bigger than you need. If in doubt please call us. 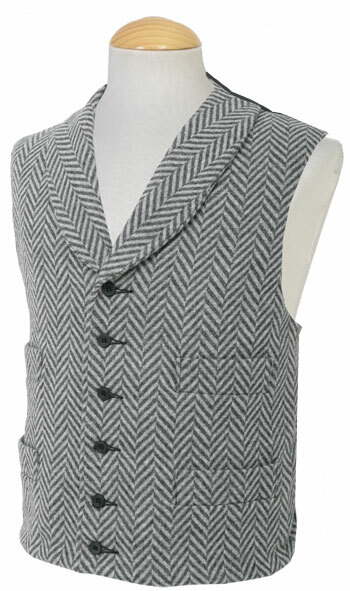 The Gambler is a single breasted waistcoat, that is a firm favourite with our western period customers. The Gambler is supplied in a choice of Wool, Tweed and Silk cloths. Please select from the list below. 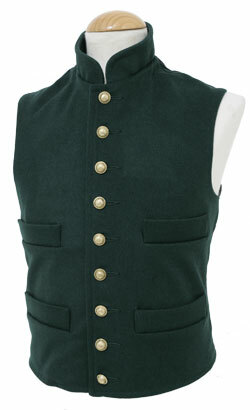 This vest is fitted with period adjustable buckle at the rear and appropriate period buttons. This vest is also available in a low cut version elsewhere in this section. CT080B US general service 16mm dia. 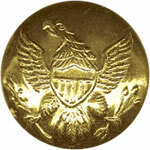 US general service enlisted man's brass eagle buttons, 16mm dia. 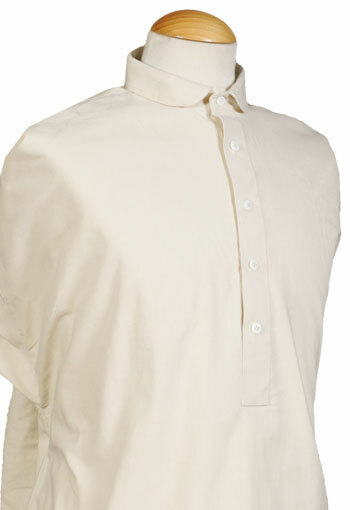 Made from 100% quality cotton, this shirt has a single button fastening to the neck. The cuffs are plain and are closed with bone buttons, an excellent shirt for civilian or military impressions. Fitted with the same underarm features as RB5037a. Please note this item is not held in stock and will be made to order in about 10-12 weeks depending on how busy we are! Nine (small) button front with small stand-up collar, made in quality wool with four exterior pockets and one interior document pocket, lined in either black, brown polished cotton or natural white calico. Fitted with period adjustable buckle at the rear. Choose from Dark Blue, Dark Green, White, Medium Grey, Charcoal, Black, Dark Brown, Medium Butternut. Your choice of buttons from our standard range. Nine (small) button front with small stand-up collar, made in quality wool with four exterior pockets and one interior document pocket, lined in either black, brown polished cotton or natural white calico. Fitted with period adjustable buckle at the rear. Choose from Medium Grey, Dark Grey, Dark Brown. Your choice of buttons from our standard range. New for 2018. We are excited to announce we have a new style of fall front trousers. They now have tabs on the 'fall' front and there is the addition of a waistband too. They are still made from military grade wool, and suitable for all regiments. 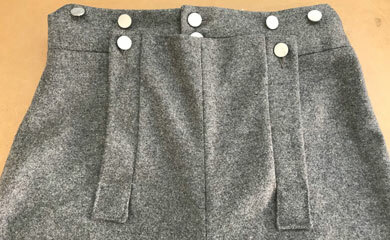 Picture shows a close up of the top of a pair of grey wool trousers. To Clarify: Inside Leg Measurement is also known as Inseam and is the length of the inside seam of your trousers, from the crutch to the hem. Waist Size refers to your largest stomach circumference, as our trousers are high waisted, and not worn as low as modern trousers. Made from 100% quality cotton, this stand and fall collared shirt has ties at the neck opening which allow the shirt to be drawn closed. 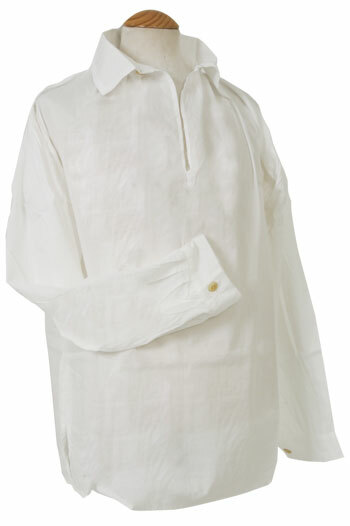 The cuffs are plain and are fastened with bone buttons, an excellent every day shirt. Please note this item is not held in stock and will be made to order in about 10-12 weeks depending on how busy we are! This is just one of our versions of an Eighteenth century Gentleman's coat, using a quality plain wool. 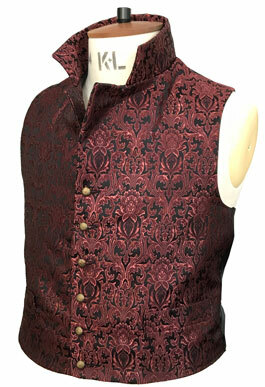 Also shown is a 'typical of the period' long silk waistcoat which is available separately. We have used a brass effect floral button with this coat, we endeavour to use the most appropriate buttons for each individual garment. Prices are subject to a postage and packing charge - All images are Subject to Copyright & may NOT be used without our written permission.